Sally Dominguez, HOG co-founder and inventor, recently spilled the dirt to Gardenista on seven water-savvy, people-friendly tips to conserve agua as the California drought continues. Yes, it’s raining now, but we have a whole lotta water to catch up on to bring our water tables and reservoirs back up! Sally Dominguez at the former home of David Gottfried, founder of the U.S. Green Building Council. 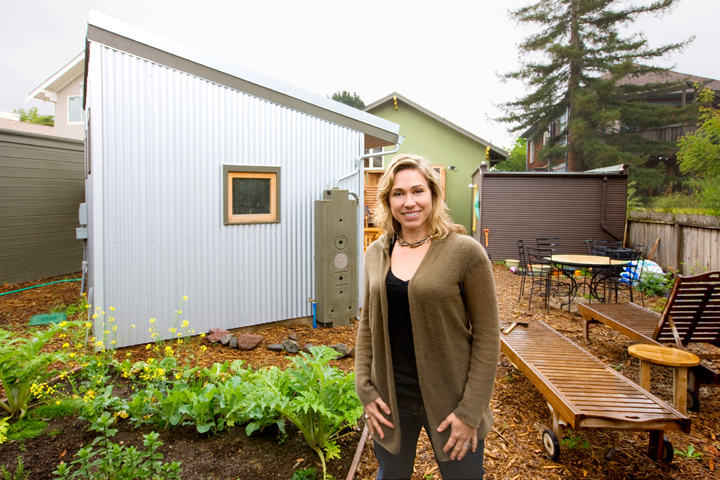 This Oakland Craftsman has 9 HOGs and at the time, the highest LEED certification of any home. 1. Collect water in the shower. Before you turn on the faucet to heat up water to take a shower, place a bucket or pail on the floor to catch running water. Use that bucket to water garden plants. 2. Keep your lawn, but water it with graywater. Drain water from the clothes washer and the shower into a holding tank and recycle it by using it on the lawn. “Don’t give up your lawn—my take on it is this: when we moved here from Australia, we went to a house for a cocktail party and saw this lush lawn. My kids and I couldn’t believe it. It looked so rich and inviting we all immediately took off our shoes and walked in it. A lawn is a beautiful, emotional thing, like a pool, and it has an emotional value. It makes a garden look beautiful and serene,” says Sally. Want to see more tips? Check out Sally’s Gardenista interview. Also keep your eyes peeled for a laundry to garden gray water kit from Rainwater HOG to debut soon! Hey California friends, we want to tell you about an ongoing water conservation contest with the opportunity to win some great prizes. The Sonoma Marin Water Saving Partnership is sponsoring the 20 Gallon Challenge. Make a commitment to save 20 gallons of water per day – this can be as simple as running the dishwasher only when it’s full or removing two minutes off of outdoor irrigation time – and enter to win through October 2013. Our water-saving tip: go for 50 gallons! Install a HOG tank to re-use your rainwater. This September, when it comes to water, we’re taking problem-solving seriously. Doctor HOG helps brainstorm solutions for Frank Katz’s two-HOG installation in New Mexico, and we get real-world perspectives on America’s water crisis from a clean energy economy advocate in California and from the president of Iowa’s largest investor-owned water utility. We also feature an award-winning, student-designed hybrid. Read more about the water-saving Washit in our B.U.G. Design section. And speaking of student-powered solutions, registration is now open for the EPA sponsored Campus Rainworks Challenge! In the spirit of brainstorming and problem solving we will be sharing some of the queries that come to us about installed HOGs or planned HOG installations. 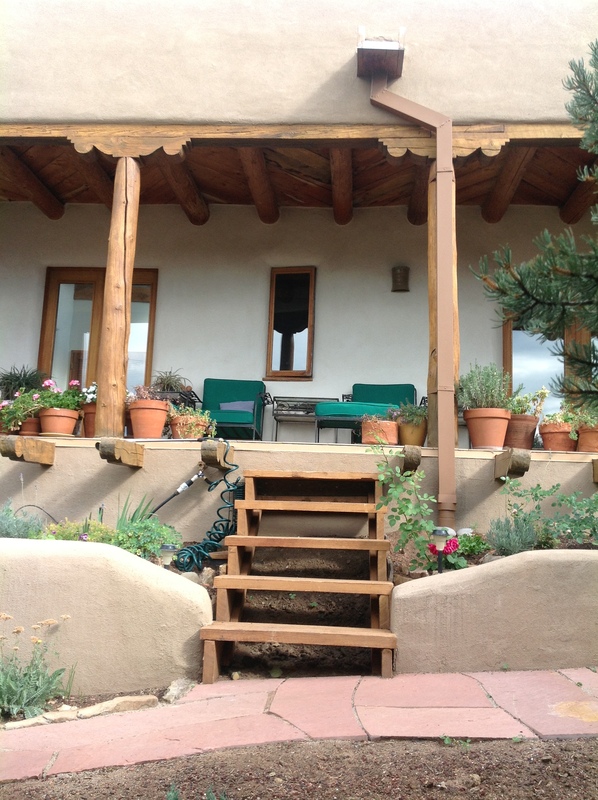 Our first is from Frank Katz in New Mexico who has two HOGs installed on their sides, and buried at the back of a raised garden bed. Potted plants and a garden make for a welcoming entrance to this Santa Fe, New Mexico home. Two HOG tanks, discreetly covered, irrigate the Katz garden. ISSUE: HELP! Heavy rain is causing my filter to block and my garden may wash away in the next big storm! 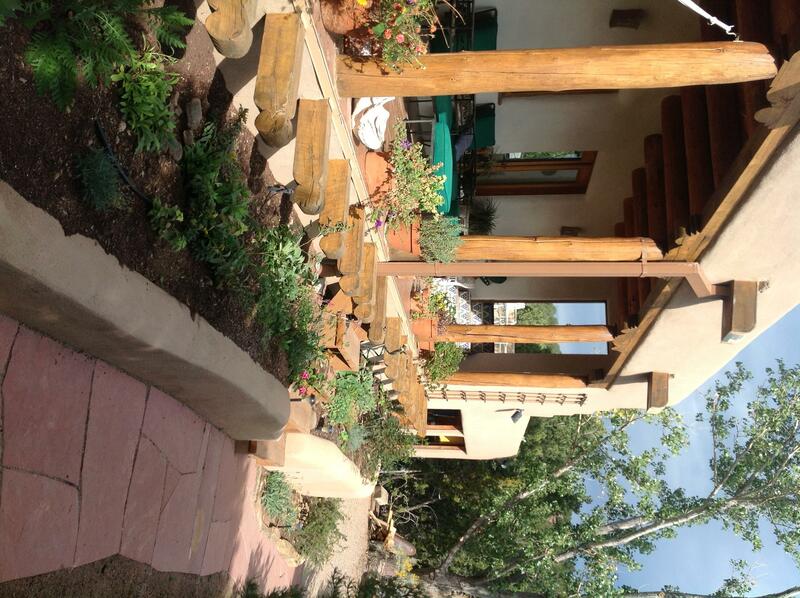 Frank installed his HOGs in summer 2012 to water his Santa Fe garden. The HOGs form the back of the raised garden, and a retaining wall at the front completes the installation. The water in the HOGs can go two ways: either via a spigot to a hose on the porch for watering potted plants, or via a drip system to the front garden. Ingeniously, Frank is using an RV pump to circulate the HOG-held water. SOLUTION: Frank plans on installing a larger filter. And he’s right: a larger filter would mitigate the heavy storm water flow. A large vortex filter, which uses cyclonic separation rather than a physical mesh to filter roof water is ideally suited to the heavy rainfall and hail of the Southwest. (Watch a video of a vortex filter at work here.) It is also important, with only 100 gallons of water storage, that the overflow from the HOGs is plumbed using larger diameter pipe (the same diameter as the downspout is best) above the level of the HOGs and the vents, and is routed away from the raised garden. Backed up debris filter? No water pressure? An unorthodox install that works like a dream? If you have questions or solutions to share, talk to Dr. HOG! The breakdown of water infrastructure in the U.S. is making headlines. Recently, we’ve come across articles with messages that resonate with reports on America’s water crisis posted in our March and April editions. He makes a compelling case for the common sense logic behind fixing the U.S.’s crumbling water infrastructure as a way to boost the economy and create jobs. He goes further to argue that when cities embrace green water infrastructure they can reduce stormwater runoff and pollutants, protect groundwater, improve air quality, and even increase property value. The approximately $10 million a year that Iowa American Water invests in their water systems helps ensure the continued stability of other infrastructure, such as transportation, roads, homes and businesses. Moore echoes some of the warning from the report on America’s Water Infrastructure Challenge featured in our April 2012 edition. He emphasizes the fact that postponing investment in updating an aging water infrastructure system ultimately increases the expense of repairs. On a brighter note, Moore also represents, in real-time, some of the solutions suggested by the Financing Sustainable Water Infrastructure highlighted in the March 2012 Whole HOG. An investor-owned water utility like Iowa American Water relies on private, market-based financing mechanisms that can better support local, customer-supported water solutions. These local water solutions can improve efficiencies, including green infrastructure, closed-loop systems and water recycling, and, as Hayes suggests, create jobs. While we might not go so far as to call the Washit “my green shower pleasure” (something might have been lost in translation from the iF award panel to us…), we’re pleased to share with you this multi-tasking, water-saving new design that combines a shower with a washing machine. Washit is a closed system shower stall/washing machine concept from four Turkish university students. The Washit re-mixes two domestic standards (the washing machine and shower stall) into one water-wise product that offers improved form and dual functionality. Why is it useful? This is a sleek hybrid of two household standby’s that allows you to take a shower and wash your clothes simultaneously. In the Washit, water used for showering is collected as grey water. Once filtered, the water is stored and ready to use again – for the shower or the washing machine. In case of water loss, water is supplemented from the water mains. Why is it green? Washit offers a revolution in the wash cycle: from your body to your clothes, at home and in public. (A public use scenario Washit offers a privacy screen for a quick clean at airports, gyms, or music festivals.) Be green while you get clean with Washit.